Few games anywhere have as much cultural significance as China’s mahjong. Last month 2,380 people gathered in the city of Doujiangyan, in China’s southwestern Sichuan province, to play the largest game of mahjong on record. The crowd simultaneously drew tiles, with Guinness on the scene to confirm the feat. Seated four to a table and shielded from drizzle by beach parasols, the groups moved and strategically maneuvered tiles emblazoned with Chinese characters and symbols across the table. The road to Doujiangyan was not easy for those who made the cut. Some 70,000 applied just to try their skill (and luck) in a preliminary qualifying round. The enthusiasm of these participants offers a microcosmic view of just how beloved mahjong is in its homeland. Today it is enthroned as king of China’s cultural exports in the realm of games. The humble act of lining up tiles holds sway in China on par with Beijing opera, landscape painting and traditional Chinese medicine. The game appears as a favored motif in literature and films, from Ang Lee’s Lust, Caution to both the book and filmed versions of Amy Tan’s tale The Joy Luck Club. There is even talk of nominating the game for inclusion in the UNESCO world heritage list. 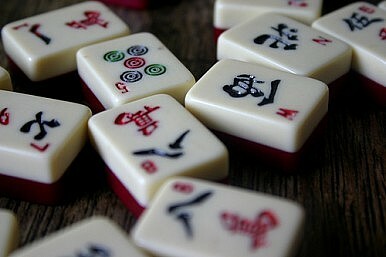 While the rules and details of the game are somewhat arcane for the uninitiated, the essential components include the following: a complete set of mahjong tiles (136 or 144, depending on the style being played), three “simple” suits (stones, characters and bamboos), two “honor” suits (winds and dragons), one optional suit (flowers), one directional die, three dice, with the optional additions of four racks for tile placement and a game board. After that, think of a Chinese version of the card game gin rummy with domino-like tiles. Various associations to the cardinal directions, pulling and throwing down the tiles, and attempts at creating various combinations (akin to Western card games) are all part of the game. A simple look at the suits can be seen here. For a how-to, read more here. Although it may seem daunting at first, the complex rules and organization of mahjong have not stopped it from becoming one of the most ubiquitous pasttimes in China. Guests at wedding banquets while away their time with the tiles, Hong Kong families roll in the Chinese New Year playing at their dinner tables, and Chinese restaurants offer the required doodads for customers. Inviting someone to play mahjong is a gesture of friendship in China. Further, it is considered good for the mental health of seniors, who can be seen sitting around tables at parks across China on just about every day of the year. As with many things in China, mahjong has a near mythic past. Some stories trace the game back to Confucius himself, who purportedly dreamed up the game around 500 BC. Appropriately, the three dragon (cardinal) tiles used in the game align with the three cardinal virtues proposed by Confucius (benevolence, sincerity and filial piety). The original name of the game, pronounced má què, literally means “sparrow” – a moniker still commonly used in southern parts of China. Legend suggests this too can be traced to none other than the father of filial piety himself, who was apparently fond of birds. Many historians, on the other hand, have attributed the game’s beginnings to a card game called madiào, which dates to the Ming dynasty. Yet other theories include conjecture that the game was developed by bored army officers during the Taiping Rebellion, that it was the brainchild of a 19th century Shanghai nobleman, or that two brothers from Ningbo (Zhejiang province) developed it around 1850. While all of this is up for debate, one thing is certain. The game was outlawed when the Communists took power in 1949. The new leadership viewed anything associated with gambling – to which mahjong is often linked – as carrying the whiff of capitalism. It was not until 1985 that the ban on the game, sans gambling, was lifted. Today it is as popular as ever. While the iconic game may be of a distinctly Sinic origin, it has gently conquered swathes of East Asia, Southeast Asia and, in more modern times, the West. Zhang Zeduan's masterpiece is on display for the first time in 10 years.